The charm of this comic thriller springs mostly from the frantic gymnastics of its hero, an old-family San Francisco aristocrat, as he conducts a quixotic search for a stolen French painting that may (or may not) prove his blood ties to Louis XVI of France. Boozy and batty Edmund Amesbury—Eddie to his intimates—is obsessed with recovering the old canvas, despite what should be more pressing concerns: Wrongly convicted of manslaughter after his mother is killed in a car crash, he’s on the run with “despair at his heels” after escaping from a mental hospital. Writer/filmmaker/playwright Carlo Caldana makes good use of his beloved city, pinballing readers from the squalor of the Tenderloin to the elegance of Nob Hill to the tony shops of Union Street, as Edmund collides with an engaging collection of supporting players: his calculating cousin, Lester; a shady art dealer called Vandegen; a shadier one named Max; a devious Chinatown beauty, Soo Ying, and—maybe best of all—a delinquent ten-year-old named Ignat Uhlman, enthralled by bloody video games and happy to use a Limoges vase as a urinal. All in all, this is a polished, entertaining performance with vivid characters and clever plot twists. 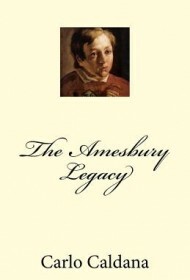 And its hero has legs: Edmund Amesbury also stars in another Caldana novel called The Wallenstein Treatment.